Black Sabbath has been so influential in the development of heavy metal rock music as to be a defining force in the style. The group took the blues-rock sound of late ’60s acts like Cream, Blue Cheer, and Vanilla Fudge to its logical conclusion, slowing the tempo, accentuating the bass, and emphasizing screaming guitar solos and howled vocals full of lyrics expressing mental anguish and macabre fantasies. If their predecessors clearly came out of an electrified blues tradition, Black Sabbath took that tradition in a new direction, and in so doing helped give birth to a musical style that continued to attract millions of fans decades later. The group was formed by four teenage friends from Aston, near Birmingham, England: Anthony “Tony” Iommi (b. Feb 19, 1948), guitar; William “Bill” Ward (b. May 5, 1948), drums; John “Ozzy” Osbourne (b. Dec 3, 1948), vocals; and Terence “Geezer” Butler (b. Jul 17, 1949), bass. They originally called their jazz-blues band Polka Tulk, later renaming themselves Earth, and they played extensively in Europe. In early 1969, they decided to change their name again when they found that they were being mistaken for another group called Earth. Butler had written a song that took its title from a novel by occult writer Dennis Wheatley, Black Sabbath, and the group adopted it as their name as well. As they attracted attention for their live performances, record labels showed interest, and they were signed to Phillips Records in 1969. In January 1970, the Phillips subsidiary Fontana released their debut single, “Evil Woman (Don’t Play Your Games With Me),” a cover of a song that had just become a U.S. hit for Crow; it did not chart. The following month, a different Phillips subsidiary, Vertigo, released Black Sabbath’s self-titled debut album, which reached the U.K. Top Ten. Though it was a less immediate success in the U.S. — where the band’s recordings were licensed to Warner Bros. Records and appeared in May 1970 — the LP broke into the American charts in August, reaching the Top 40, remaining in the charts over a year, and selling a million copies. 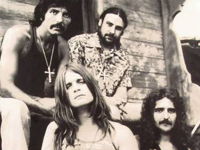 Appearing at the start of the ’70s, Black Sabbath embodied the Balkanization of popular music that followed the relatively homogenous second half of the 1960s. As exemplified by its most popular act, the Beatles, the 1960s suggested that many different aspects of popular music could be integrated into an eclectic style with a broad appeal. The Beatles were as likely to perform an acoustic ballad as a hard rocker or R&B-influenced tune. At the start of the 1970s, however, those styles began to become more discrete for new artists, with soft rockers like James Taylor and the Carpenters emerging to play only ballad material, and hard rockers like Led Zeppelin and Grand Funk Railroad taking a radically different course, while R&B music turned increasingly militant. The first wave of rock critics, which had come into existence with the Beatles, was dismayed with this development, and the new acts tended to be poorly reviewed despite their popularity. Black Sabbath, which took an even more extreme tack than the still blues- and folk-based Led Zeppelin, was lambasted by critics (and though they eventually made their peace with Zeppelin, they never did with Sabbath). But the band had discovered a new audience eager for its uncompromising approach. The new lineup took its time getting into the recording studio, not releasing its first effort until April 1980 with Heaven and Hell. The result was a commercial resurgence. In the U.S., the album was a million-seller; in Britain, it was a Top Ten hit that threw off two chart singles, “Neon Knights” and “Die Young.” (At the same time, the band’s former British record label issued a five-year old concert album, Black Sabbath Live at Last, that was quickly withdrawn, though not before making the U.K. Top Five, and reissued “Paranoid” as a single, getting it into the Top 20.) Meanwhile, drummer Bill Ward left Black Sabbath due to ill health and was replaced by Vinnie Appice. The lineup of Iommi, Butler, Dio, and Appice then recorded Mob Rules (November 1981), which was almost as successful as its predecessor: In the U.S., it went gold, and in the U.K. it reached the Top 20 and spawned two chart singles, the title track and “Turn up the Night.” Next on the schedule was a concert album, but Iommi and Dio clashed over the mixing of it, and by the time Live Evil appeared in January 1983, Dio had left Black Sabbath, taking Appice with him. The group reorganized by persuading original drummer Bill Ward to return and, in a move that surprised heavy metal fans, recruiting Ian Gillan (b. Aug. 19, 1945), former lead singer of Black Sabbath rivals Deep Purple. This lineup — Iommi, Butler, Ward, and Gillan — recorded Born Again, released in September 1983. Black Sabbath hit the road prior to the album’s release, with drummer Bev Bevan (b. Nov 25, 1946) substituting for Ward, who would return to the band in the spring of 1984. The album was a Top Five hit in the U.K. but only made the Top 40 in the U.S. Gillan remained with Black Sabbath until March 1984, when he joined a Deep Purple reunion and was replaced by singer Dave Donato, who was in the band until October without being featured on any of its recordings. Black Sabbath reunited with Ozzy Osbourne for its set at the Live Aid concert on July 13, 1985, but soon after the performance, bassist Geezer Butler left the band, and with that the group became guitarist Tony Iommi’s vehicle, a fact emphasized by the next album, Seventh Star, released in January 1986 and credited to “Black Sabbath featuring Tony Iommi.” On this release, the lineup was Iommi (guitar); another former Deep Purple singer, Glenn Hughes (b. Aug 21, 1952) (vocals); Dave Spitz (bass); Geoff Nichols (keyboards); and Eric Singer (drums). The album was a modest commercial success, but the new band began to fragment immediately, with Hughes replaced by singer Ray Gillen for the promotional tour in March 1986. With Black Sabbath now consisting of Iommi and his employees, personnel changes were rapid. The Eternal Idol (November 1987), which failed to crack the U.K. Top 50 or the U.S. Top 100, featured a returning Bev Bevan, bassist Bob Daisley, and singer Tony Martin. Bevan and Daisley didn’t stay long, and there were several replacements in the bass and drum positions over the next couple of years. Headless Cross (April 1989), the band’s first album for I.R.S. Records, found veteran drummer Cozy Powell (b. Dec 29, 1947, d. Apr 5, 1998) and bassist Laurence Cottle joining Iommi and Martin. It marked a slight uptick in Black Sabbath’s fortunes at home, with the title song managing a week in the singles charts. Shortly after its release, Cottle was replaced by bassist Neil Murray. With Geoff Nichols back on keyboards, this lineup made Tyr (August 1990), which charted in the Top 40 in the U.K. but became Black Sabbath’s first regular album to miss the U.S. charts. Iommi was able to reunite the 1979-1983 lineup of the band — himself, Geezer Butler, Ronnie James Dio, and Vinnie Appice — for Dehumanizer (June 1992), which brought Black Sabbath back into the American Top 50 for the first time in nine years, while in the U.K. the album spawned “TV Crimes,” their first Top 40 hit in a decade. And on November 15, 1992, Iommi, Butler, and Appice backed Ozzy Osbourne as part of what was billed as the singer’s final live appearance. Shortly after, it was announced that Osbourne would be rejoining Black Sabbath.